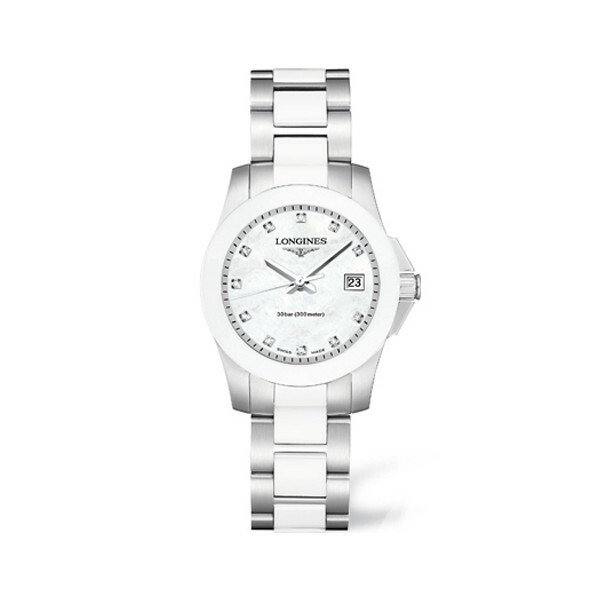 Watch LONGINES CONQUEST Ms. steel and ceramic white, reference L3.257.4.87.7, SWISS MADE movement quartz CAL.250, box steel with 1 diameter 29 mm. WATER RESISTANT 300m, Sapphire Crystal mother of Pearl Dial with 11 diamonds TOTAL weight 0, 031ct. STEEL and ceramic with clasp bracelet Butterfly with 2 pushers.